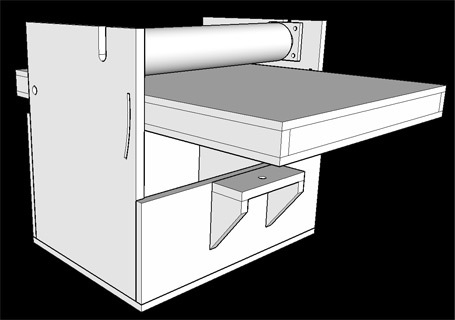 The table pivots on an axis at the back of the machine, and is raised and lowered by a threaded rod at the front. This means the table is at varying angles depending on the height setting, which makes it more difficult to set up support for long stock. The further back the pivot point is from the drum the less severe the angle will be for a given height. You can set the table so that it's level at the most frequently used height, usually 3/4". One the original version I used a piano hinge on the back rail for the pivot and pillow block bearings for the drum. It's difficult to get this set up correctly, as it's important that the axis the table pivots on is parallel to the drum. For the new version I used steel pins in bronze bushings for the pivot and flanged bearings for the drum. All you have to do is drill your holes for the pivot and drum shaft in the same spot and build everything square and it will be aligned. The model is pretty close to what I built, but the thickness of the ply is given as 3/4" so it's not completely accurate as the ply is undersized. Also there's some hole sizes that are a bit off that I haven't fixed yet, but I give all the sizes for these as we go along. If you were doing the 9" drum version you only need to reduce the width by 9 inches, and can make the cabinet shorter for a smaller motor and less maximum thickness.